Pictured in photo, from left to right: Krystal Harrison, development coordinator, CWEALF; Jessica Grossarth, partner, Pullman & Comley; Diane Whitney, partner, Pullman & Comley; Alice Pritchard, executive director, CWEALF; Lisa Herrara, legal education and outreach manager, CWEALF; Nilda Rivera, community advocate, CWEALF; and Catherine Bailey, legal and public policy director, CWEALF. Hartford, CT October 15, 2013: More than 125 women professionals from the greater Hartford area assembled on the evening of October 10 at Pullman & Comley's 2013 Women's Tea held at the Wadsworth Atheneum. Now in its third year in Hartford, the event sponsored by Pullman & Comley's Women's Leadership Initiative provides an opportunity for women professionals from the business, nonprofit and public sector to network while also supporting the work of a local nonprofit organization. 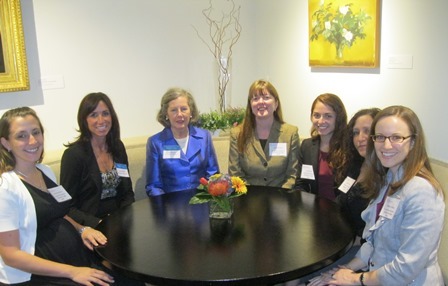 This year's event highlighted the work of the Connecticut Women's Education and Legal Fund (CWEALF), which has worked to advance women's rights and opportunities in Connecticut since 1973. Through their three key programs of legal education, public policy and advocacy, and research and evaluation, CWEALF initiates services to educate and empower women and girls to ensure they have the tools, knowledge and avenues to reach their goals. As one of the oldest women's rights organizations in the country, CWEALF is a vital resource to women and policy makers in Connecticut. Pullman & Comley, LLC provides a wide range of legal services to clients in the New England region, as well as throughout the United States and internationally. The firm’s major practice areas include business organizations; environmental and land use; government finance; health care; labor, employment law and employee benefits; litigation; property valuation; real estate; regulatory, energy and telecommunications and trusts and estates. The firm has offices in Bridgeport, Hartford, Stamford, Waterbury and White Plains. The firm is an active member of the Law Firm Alliance, an international affiliation of law firms. For more information, please visit www.pullcom.com.